The 2014 Memsie Stakes is here which sees the eve of the Spring Carnival and some exiting racing in Australia. All eyes will be at a sun filled Caulfield after the big rain in Sydney washed out majority of racing recently costing the gambling and racing industry millions potential income. 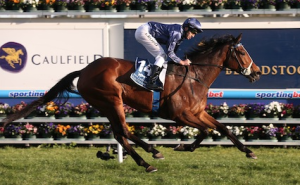 Its going to be a star studded race for the Memsie Stakes with six of the eleven starters having won a group 1 race in the past making for a very competitive race with some great odds to be had . My Memsie Stakes tip is Boban will take the chocolates paying $3.80 fixed odds at Sportsbet at the moment. I think the odds will drift a little so expect to be able to get around $4.20 by the time they are loading in the barrier. Boban has shown a lot of potential when it counts winning the Moonga on Cup day last year and edging out A Dundeel earlier this year. Trainer Chris Waller will have his finger crossed that Boban’s form will return for the Memsie Stakes at Caulfield on Saturday. Puissance De Lune looks to show some potential after a promising return from injury but drawing barrier one will be a tough ask with the class of the field around him. There has been some interest in Puissance De Lune starting at 12 and coming into 10’s with Sportsbet so it might be worth putting in your first four bets. Sportsbet currently has a great free bet offer giving racing punters a $25 free bet just for depositing $5.00. See the Sportsbet site here for more info on this offer and to see the latest odds for the Memsie Stakes. The days racing will be shown on channel 7 in some states so get comfortable with the Sportsbet mobile app on the couch and watch a great days racing. Heres a video of the 2013 Memsie Stakes where Atlantic Jewel took the win.